Outdoor work sites are prone to numerous unpredictable, weather-related factors, including rain, snow and fog. Preparing for such natural elements is critical to maintaining the safety of workers, reducing damage to equipment and promoting productivity. Why Does Wind Matter for Light Towers? 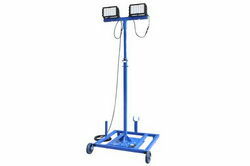 For industrial light towers, the presence of strong winds in the location could severely impact deployment. Depending on the type of wind (more on this later), the mast and foundational components of the structure may experience unwanted vibration or shaking, cracks in the coating and – in the worst case scenario – tipping. Understanding the characteristics of wind and the natural patterns of air movement can help ensure proper and safe operation at the outdoor site. By definition, wind simply refers to air in motion. Winds form due to uneven heating of the earth’s surface. Clouds, varying elevations, sunlight angles, rotation of the earth, bodies of water and differences in temperature all contribute to wind formation. The natural phenomenon can be further characterized by its direction, speed and duration. When it comes to direction, wind usually moves from a high-pressure area to a low-pressure area. The rate at which wind moves is dictated by the difference in pressure, suggesting that great differences in pressure between two locations causes air to flow faster. There are several types of wind, which affect light towers and poles differently. A gust of wind is a brief, intense movement of air – lasting roughly 20 seconds, at two-minute intervals. In order for the classification to be valid, peak wind speed must reach 16 knots (minimum), with variation between peaks and lulls at 9 knots (minimum). The term ‘peak wind’ refers to the highest wind speed measurement within a 24-hour window. On the other hand, constant wind refers to air movement that does not change. In outdoor environments, such elements are virtually non-existent because wind always varies due to persistent changes in pressure and temperature. Constant wind can be found in wind tunnels, testing sites and scientific labs. For industrial light towers, the average wind speed experienced by a location may help gauge the effectiveness of the pole’s ability to provide a sturdy foundation for mounted equipment during use. Average wind speed readings are based on a set of measurements taken frequently, over a period of time. Light towers typically come with wind speed ratings, which provides information about the structure’s ability to withstand certain types of wind. Based on existing scales, the ratings refer to specific descriptions and wind speed variables. For instance, when a light tower comes with a wind speed rating of 38 km/hr, the unit is capable of withstanding ‘fresh breeze’ (international description) or ‘fresh wind’ (US weather bureau description) – according to the Beaufort Scale. Moreover, the light mast is suitable for deployment in locations that experience the following: calm/light wind (<1 km/hr), light air/breeze (1-11 km/hr) and gentle/moderate breeze (12-28 km/hr). A light tower with a ‘freeze breeze’ threshold is not ideal for outdoor work sites that are prone to the following: strong/fresh gale (39-74 km/hr), storms (103-117 km/hr) and hurricanes (>117 km/hr).